Prospecting & sales scripts for selling products. Script to sell products. and Prospecting script for selling products. A script to sell products using the telephone has traditionally been the way to get new business. Script for selling a product are written for salespeople, marketing departments and corporate sales staff to help salespeople remember what to say when they make a prospecting call. Script for selling a product are written so that 3 out of 4 people that receive calls can understand them. In any field of endeavor, in any sport, even in love, the choice is obvious. Say the words that people will understand. No need to belabor the point, that’s why you’re reading this page of the web site. A script writing kit to write your own additional prospecting scripts. Selling products by telephone has never really gone out of style regardless of the "technical revolution." Business's are using the telephone to reach prospects because of the proliferation of relatively inexpensive cell phones and the use of social media. Prospecting for selling products by using the telephone is a valuable source of new business and is the lifeblood of the sales of products. The single greatest advantage a script for selling of products are the words that are written down and ready at all times. In other words, a well conceived script. Selling script for products by using the telephone is the basic method of communication. How much dialogue is necessary to get an appointment? Determine the average number of sentences in a sales call. The most important statistic is determining the average number of sentences of the typical sales call. It will vary according to the type of business you're in. Script to sell products must be conscious of how long it takes to say something. Suffice to say it will be less than you think. Prospects listen that the rate of about 400 words per minute. They read at a rate of only 225 wpm. You can speak approximately 150 to 250 words per minute. Approximately 300 words and 6 to 9 sentences would equal about 90 seconds. Everyone still uses the telephone and direct calling by phone is not about to be replaced anytime soon. Telephone prospecting for the sale of products without pressure. Having a well written script for selling products gives you 6 ways to say something instead of just one way. Scripts for selling products insures that the salesperson gives the same uniform message, guarantees, and policies that the company must stand behind. When you are skillful with the words used in a sales scripts, you don't have to constantly use pressure or be manipulative. No memorizing required! You don't have to memorize long wordy scripts ... you just have to know where the headings are located. Simply flip to a heading page & choose one of the 6 "1-liners" and read it aloud to the prospect. It works better then any other method to use a sales script for selling products to get new prospects. Prospecting using the telephone is the best connection that can be made. You can ask for business in person and you get immediate results. You choose the time to make the call to the people you wish to do business with. Shown is Richard Blizniks book ... "How To Write Yor Own Prospecting Script"
A script for selling products are a cost-effective sales tool. Selling products by telephone is the most cost effective method of prospecting for new business. A telephone call worth all of the other marketing methods combined. It is the single most often overlooked factor that is worth of all other activities that the company does. If the cost of selling products by telephone is lower then other forms of marketing, then telephone prospecting should take priority and that method should get the most resources. The cost of getting a new prospect is the litmus test of choosing a marketing method. By estimating the cost effectiveness of each marketing method, you will soon discover the return on each dollar spent. The common denominator is that each method of getting new business “all cost money. Cost of sales should be measured. Calculate the cost of each method to see if it is cost effective enough to continue using each method of prospecting. You can estimate the number of “bone-fide” prospects that come from each method. Calculate the cost per customer, including those that are in the “pipeline” to see if each type of expenditure is justified. Spending money unnecessarily is an important decision that only you can make when figuring out your business strategy. Your next task is to decide how you contact the prospect in the most cost efficient way. Results of purchasing a script for selling products can be evaluated. Start by listing all of the marketing methods to get new business. It could be from; newspaper advertising, magazine advertising, television, radio, mail campaigns, direct calling, networking, referral, yellow-pages, internet web site, or prospects that simply walk in to your store or office. Direct call contact is the best method of prospecting. Identify all sources and marketing methods of where your business comes. Measure the results of direct calling using the telephone. Determine whether the marketing method is active or passive, and direct or indirect. What a business really does to generate business. It takes a special person who can be turned down repeatedly yet keep their attitude positive and there their spirits up and they are involved at every step of the selling process. Is it any wonder that a sales call is complicated. Priorities & methods for getting new business. Prioritize which method creates more prospects for getting new business. Many companies overlook the simple procedure of prioritizing their sources to obtain new business. In your marketing plan, should you advertising on television, radio, and magazines be a part of your business plan? It's should be a part of your business plan only if you can afford it. Company owners and professional salespeople are pulled in every direction by those who give convincing arguments favoring their own pet method. 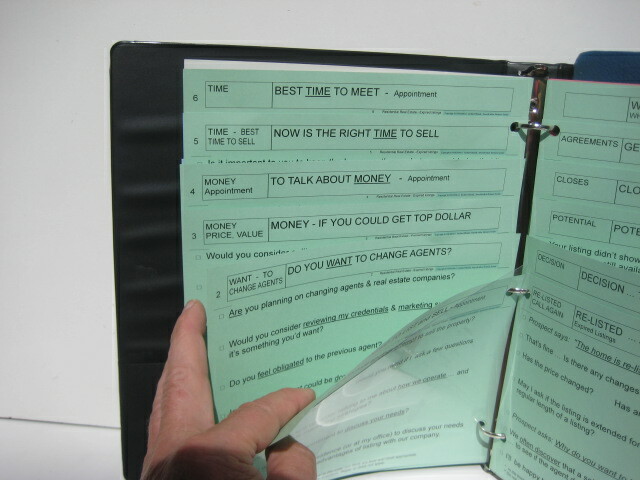 Prospecting scripts to sell products is a neccessary part of the sales process. You must find out where in the prospecting process the first contact is made. A “flow chart” of all the components of the selling process will show where the appointment to sell appears. Prospecting by telephone can quickly be spotted on such a flow chart. They prospects will try to Deflect, Delay, Distract, Defer, Sidetrack, Hinder, Postpone, Prevent and Reject your prosecting call with a real or imagined objections or to simply make it hard on the salesperson. It all starts with planning on what you are going to say. Often, when composing a script for selling products the actual selling words get glossed over. Getting new business prospect involves selling the features and benefits of a product or service. A sales script to sell products just adds the proper elements to every prospecting situation. If you can remove the fear of the telephone prospecting call, your business revenue will increase. Below is a list of headings & categories contained in the prospecting script for the sale of products. 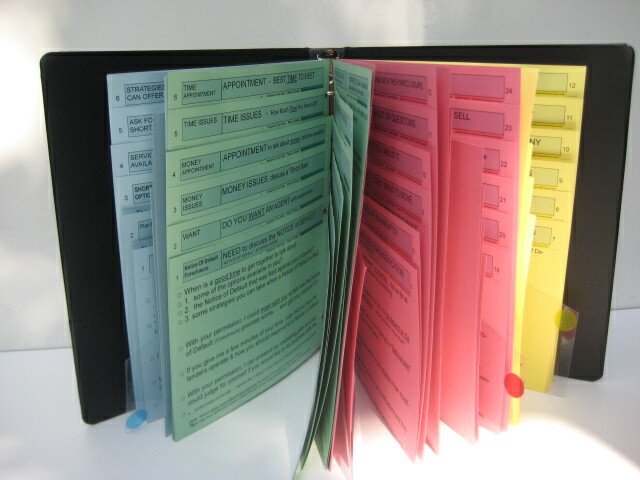 GREEN a total of 24 pages. Lead-off scripts & sales-openers. 12 pages of dialogue that identifies you, gives a reason for the call, and states a brief selling message. Building our business. Building my client base. Calling clients who must buy. Call to present my products. Old prospect, renew interest. Calling early or calling after business hours. Referral from a person who knows you. Follow-up call after a mailing. 12 pages of dialogue that means it's your turn to Talk Usually asking questions, requesting an appointment, etc. To Discuss Needs. Potential & Desire for Our Products & Services. Do They Want My Services. Decision To buy Products & Services. Talk About Money & Best Price. Close on Quality of Services & Best value. To Discuss Finances. Commitment to Buy the Products & Services. Get an Agreement. Best Time to Meet. Overcome Reluctance & Build relationships. I’m not interested Not Now - Maybe in the Future. Whatever you’re selling I don't want. I Don’t Need to Buy Right Now. I don’t need your products or services. I’m Getting A Lot Of Calls. I don’t want your products or services. Call Me Some Other Time. Too busy - No time to see you. Why Are You Calling? Send Me Some Information. I’ll Think about It. - Non-committal. I Can Get a Better Price. I Want to Wait. Will you negotiate your prices? Wait for Something to Change. Others Will Cut Their Price. Stalling - Won’t Make a Commitment. Will You Cut Your Price? Why Should I Choose You? Why should I choose your products & services? Not Now. I’m not interested unless the price is right. Why should I change Suppliers? Friend in the Business - Sells similar services. Bad Experience with product, company, salespeople. YELLOW pages are the Selling dialogue. The reasons & benefits to do business with you. There are many places to "fill in the blanks" for you to personalize the scripts. A salesperson should have at thier fingertips a presentation about their products & services. 30 Second Commercial .. aka. Elevator pitch. 3 Reasons to Choose Our Company. Profile of Services & Salesperson Profile. 3 Reasons to Choose Our Products and Services. Incentives To Choose Our Services. Benefits of Choosing Our Product and Services. 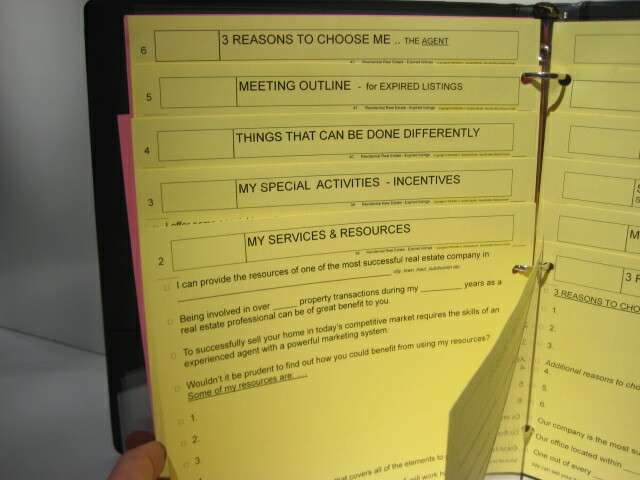 Reasons To Meet With Me - Meeting Outline. Company Profile - History - Facts. Salespersons Personal Profile. Important Information - Phone numbers etc. and an up-grade to a Genuine Leather portfolio. No one owns the prospects. If you had all the new business you ever want, put your feet up and relax. No one would ever think of making a play for your customers, ... right? People making a prospecting script to sell a product must do it all and are on the frontline of prospecting and selling. It's where the rubber meets the road. It doesn't get any more basic than a business sales person calling to sell products. 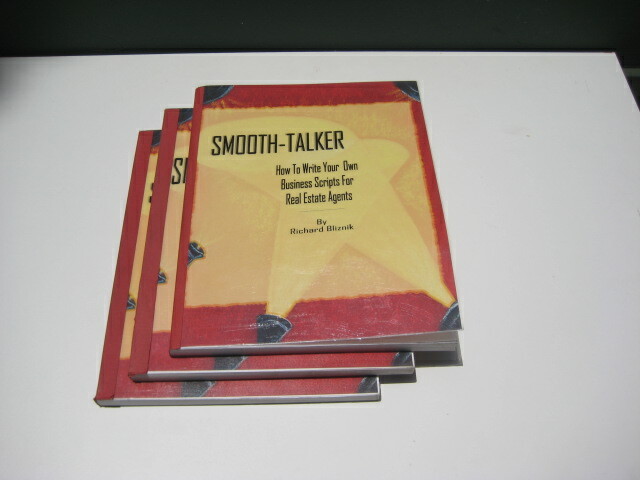 That's why Smooth-talker Sales & Prospects were written and published. A script to sell products insures that courtesy is used. Scripts for selling products insures that courtesy will always be used. Courteous dialogue can be demanded from all salespeople and they are expected not to deviate. Scripts for product sales then becomes the standard by which all other sales conversations can be measured. 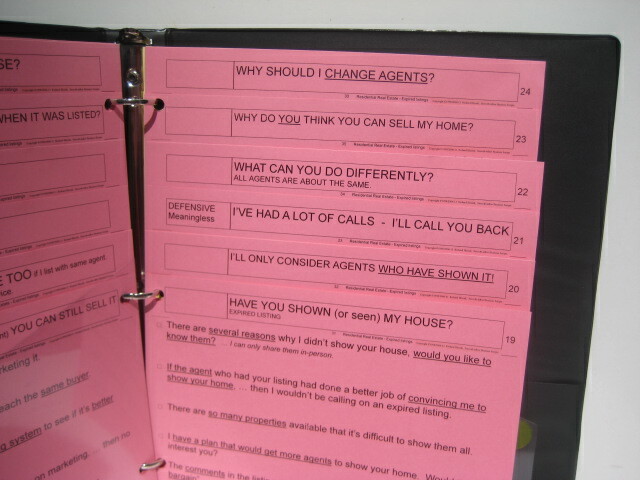 Using a script for the sale of products prevents "home-spun" dialogue. 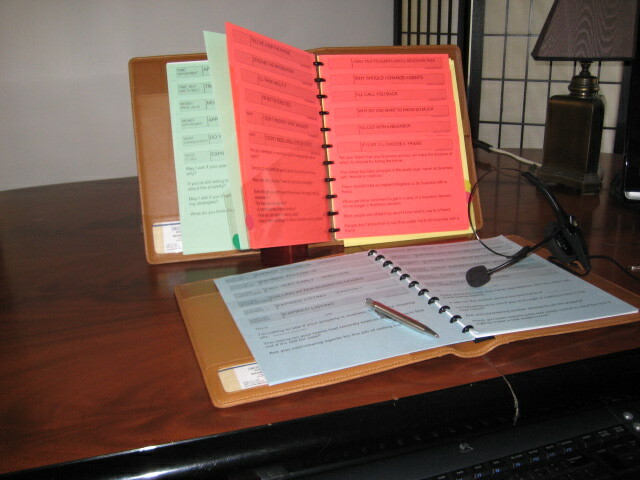 Using a script eliminates a person from using their own brand of sales dialogue. A sales script for product sales promotes consistency and prevents them from using their own “homespun” words. Scripts for selling products insures that the salesperson is sticking to a script eliminates the latest buzz-words that can become a source of misunderstanding. Buzz words have created problems for the business world because they change so often.